installed right next to tanks or vats. This versatile controller is ideal for a wide variety of applications, such as textiles, papers, photographic solutions, plating baths, chemicals and water treatment. BL 931700 is provided with a selectable set point for acid or basic dosage. Measurements are directly acquired from a pH electrode in the range from 0 to 14 with a 0.01 pH resolution. Accuracy is ensured by the 2 point calibration, performed manually through trimmers on the front panel. You can also choose automatic or manual dosing mode with a switch on front panel. Manual control is particularly useful during maintenance operations, because it permits you to enable or disable the dosing relay according to your need. The overtime control system advises you when the relay is active too long, helping to prevent overdosing. 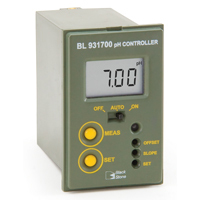 In addition, this model features a 4-20 mA analog output for recorder connection. Two models are available, with different power supply input at 115/230 Vac or 12 Vdc.